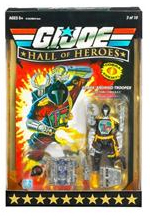 Description Of Item: A Real American Hero... and Cobra! Since 2007, Hasbro captured hearts, minds, and enemy combatants with its 25th Anniversary G.I. Joe Action Figure line. Now, the best of the best were voted on by fans and have been redecorated and issued in this deluxe collector packaging! Each carded action figure comes sealed, and that package is placed inside another large, collectible box. With gold foil and amazing character art, this assortment is sure to please!